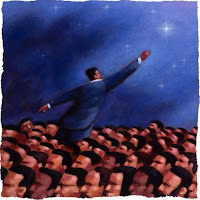 Corporate Instinct: You can be too fantastic you know! This image of great leadership is so removed from me that he or she may as well be from a different planet. I’m never going to be like that, so I may as well stop trying and crawl back to where I belong! Secondly, even if I choose to stay working hard for my fantastic leader, what is it that I can contribute? S/he’s better than me at everything, doesn’t need my advice or support, doesn’t need me to take up the running when s/he’s plain tired or fed-up. What is there to motivate me in just doing what I’m told? Where’s my autonomy? Where’s my creativity? Where’s my sense that I’m contributing something special? How do I retain the enthusiasm and active commitment of my people? How do I ensure I don’t inadvertently create an over-dependence? How do I nurture leaders at all levels in my organisation? How do I ensure the organisation will survive and thrive after I’m gone? Oh and another thing, - please lets not pretend to be the perfect leader. If we succeed we alienate everyone and if we fail we look foolish - and still alienate everyone!